If you’re as busy as I am all week, then you probably have a hard enough time sitting down in front of the computer, let alone remembering what sites you want to visit. That’s why I’m creating an easy way for readers to stay in touch. Just enter your information below and each month you’ll get a quick email with the most popular posts, new crochet patterns and special offers just for being a fan. To get things rolling, I’m going to give away one free crochet pattern of your choice to 10 lucky fans from the first 100 subscribers. Don’t fret if you don’t win right away, because I’m going to keep giving two patterns away for every 100 new subscribers and there will be plenty of free patterns in the newsletter itself. No one likes unsolicited email, so this newsletter requires you to double opt-in to prevent a 3rd party from subscribing you without your consent. All that means is that after entering your information below, you will automatically receive a message asking you to confirm your email address. Simply open that first email, click the link and you’re subscribed! 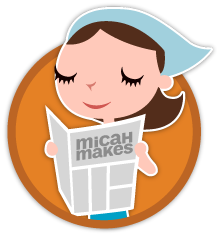 MicahMakes takes your privacy very seriously. I will never sell, share or rent your information to others for any reason. The last thing you busy crafters need is more spam clogging up your inbox. You’ve got nothing to lose by subscribing except missing some crafty news, fun ideas and a chance to win a great crochet pattern. Sign up today!